To build a customized Android SDK is a option to develop your SDK tools. In following section will talk about how to build a Android SDK. Before you read this paragraph, you need to know how to build a Android Build Environment in advance. Android SDK is very easy to build up. After you finish both the Android Build Environment setup and a particular version of Android Source Code downloaded, you can do it by following command. 1. Go to root folder of Android Source Code. 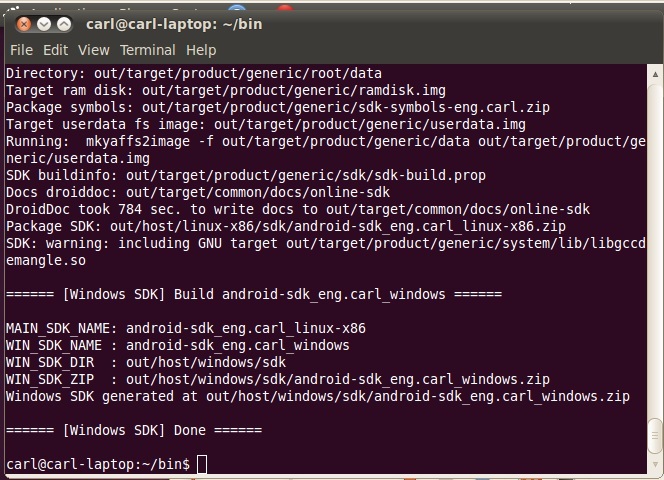 The Android SDK on Linux is started to build. Note that in case you want to build a Windows Android SDK, to perform the above actions in advance. Or the build process of Windows Android SDK would fail because of lack of something it needs from Linux Android SDK. 3. In case you want to build a Windows Android SDK, perform the following commands. The build process will finish after a long time. It depends on the performance of your build machine. You will see the following screen once the build process is successfully. Smart Embedded/Mobile Device Verification Design for over 10 years. Web/Database System Integrated design for over 2 years. Master degree in computer science, AS degree in Electronic Engineering, PMP certified.